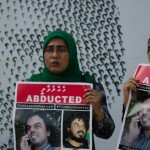 Police arrested a fourth suspect yesterday in connection with the disappearance of Minivan News journalist Ahmed Rilwan. A 25-year-old was taken into custody with an arrest warrant, police revealed, after which the Criminal Court granted an extension of remand detention for five days. Police said “special efforts” are underway to investigate Rilwan’s disappearance and locate the missing journalist, declining to reveal any further details. Rilwan has been missing for 53 days and is believed to have been abducted at knife point outside his apartment building in Hulhumalé around 2:00am on August 8. The Maldivian Democracy Network (MDN) welcomed the arrests as “progress in the police investigation” and offered its support. “The Criminal Court’s extension of their detention signifies progress in the investigation,” said MDN. Police also told local media yesterday that the arrests represented progress in the investigation and that police were working on “reaching a good result”. However, the police have yet to offer possible theories or lines of inquiry being followed in the investigation, noting on September 15 that no “conclusive evidence” has been found between Rilwan’s disappearance and a reported abduction outside his apartment building. MDN meanwhile released an investigation report last week implicating radicalised gangs in Rilwan’s suspected abduction. The investigation report by Glasgow-based Athena Security confirmed evidence of possible “hostile surveillance” of Rilwan at the Hulhumalé ferry terminal in Malé conducted by two known affiliates of Malé-based Kuda Henveiru gang. One of the suspects is identified as Ahmed Shiran Saeed. Minivan News understands Shiran is currently in police custody for unrelated charges. Citing the abduction of several young men in June by a vigilante group in a push to identify online activists advocating secularism or professing atheism, the report said gang activity in Rilwan’s abduction was a “strong possibility”. The report noted increased radical activity among members of three main gangs in Malé – Bosnia, Kuda Henveiru, and Buru – and claimed members had participated in attacks against individuals they deem “un-Islamic”. Rilwan had “regularly received clear threats to his life” for his outspoken criticism of religious extremists, the report said. One man named in the report, vandalised Minivan News’ security camera on Thursday (September 25) shortly before two others buried a machete in the building’s door. While police arrested a 32-year-old suspect Thursday night on charges of stealing the security camera – clearly identifiable on the CCTV footage – the Criminal Court released the suspect with conditions the following day. The opposition Maldivian Democratic Party (MDP) office was meanwhile set on fire in the early hours of the morning on Friday (September 26), and the door of former MDP MP Hamid Abdul Ghafoor’s residence was set ablaze. The arson attacks followed vandalism of the main opposition party’s office for two consecutive nights and numerous death threats sent from unlisted numbers to MDP MPs, the party’s senior members, and dozens of journalists. “This is a war between the laadheenee [secular or irreligious] MDP mob and religious people. We advise the media not to come in the middle of this. We won’t hesitate to kill you,” read the threat to journalists. Haven't we herd enough about this journalist yet?